A lesson is the best way to learn to stop. Using you heel brake is not an intuitive skill and yet stopping is the most critical skill set of the sport. A lesson will help you to attain a solid foundation of outdoor skills so that you can make skating a lifetime activity. A lesson can help you prevent and/or correct bad skating habits you picked up naturally. 99.9 % of competent skaters have very inefficient skating technique. A lesson can significantly improve your skating efficiency by showing you proper striding technique. Professional instruction can help existing skaters attain the next level of performance. A lesson is interactive. An instructor can monitor your performance and provide specific feedback designed to help you succeed with each new skating skill. A lesson guarantees you will have a qualified instructor. Well-meaning family, friends and significant others who know how to skate does not mean they are able to teach you how to skate. 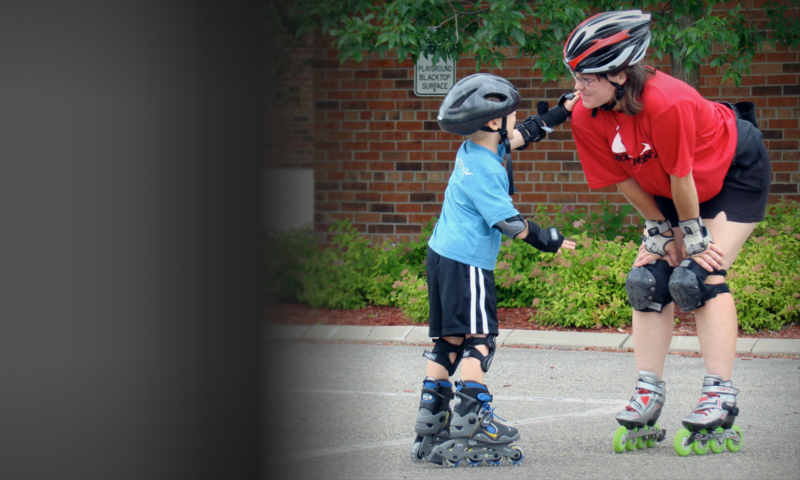 A lesson is for any age because inline skating is a recreational, lifetime fitness activity. A lesson informs you of your ability level. When skate manufacturers instruct you to “know your ability level”, an instructor informs you of your ability level. A lesson can be social. When shared with others who, like you, want to learn to skate. Groups lessons can be a blast! A lesson is fun. Instructors can be great at teaching skating in a fun manner, taking stress out of learning. A lesson helps build your confidence. Instructors ensure a successful first outing on inline skates. A lesson mitigates injuries. Professional instruction and proper protective equipment are two of the most critical aspects that make skating a safe sport. Robichon’s professional instructor adjusts student’s body position.